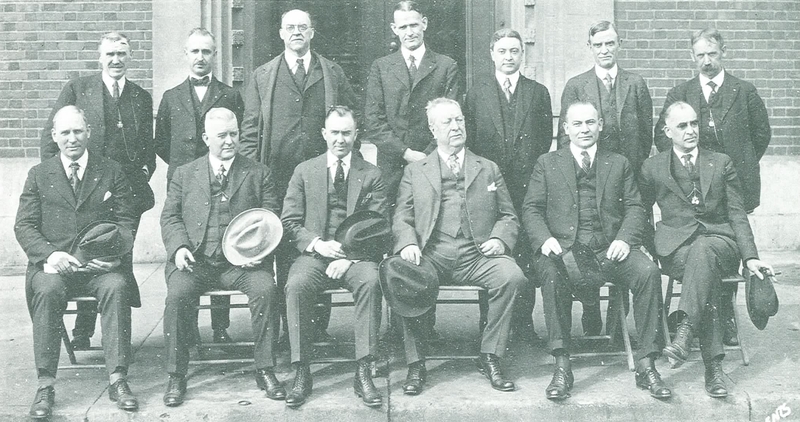 The first Annual Session of The Grand Council of the Order of DeMolay for Boys was held in Kansas City, Missouri at the Scottish Rite Temple on March 7, 1921 with Alexander G. Cochran presiding as Acting Grand Master Councilor. Eleven of the original thirteen members were present. The first order of business was the adoption of the Constitution and Statutes as created by the original, or, Formation Committee. The Constitution and Statutes as adopted provided that the number of members of the Grand Council was to be fixed at not exceeding fifty. The second order of business was to elect Alexander G. Cochran as the first Grand Master Councilor. A Deputy Grand Master Councilor, Grand Senior Councilor, Grand Junior Councilor, Grand Treasurer were also elected, with Dad Land elected as Grand Scribe. New members, all Masons, were elected to the Council to represent the Order of DeMolay’s interests in Colorado, Nebraska, Kansas, South Dakota, Iowa and California. Then Judge Cochran appointed a full line of officers to parallel the Chapter, with Louis Lower appointed to be the Grand Sentinel. He wasn’t a member, but Dad Land wanted him to be on hand, and guarding the door was as close as he could get while he wasn’t a Mason. The Obligatory Days Committee was appointed, and on the same day they reported, naming the following as Obligatory Days for all members: Patriots’ Day, Parents’ Day, DeMolay Day of Comfort, Devotional Day, and Educational Day. “Dad” Land, as Grand Scribe presented a list of 52 chapters that requested the granting of a permanent charter, all having been granted Letters Temporary by Dad Land, before the Grand Council had been formed. The active membership of the 52 chapters as of January 31, 1921, was 3,336. All 52 requests were granted. They also set the financial year of the Order, and set some fees to generate funds to cover costs that had been paid for by donors. 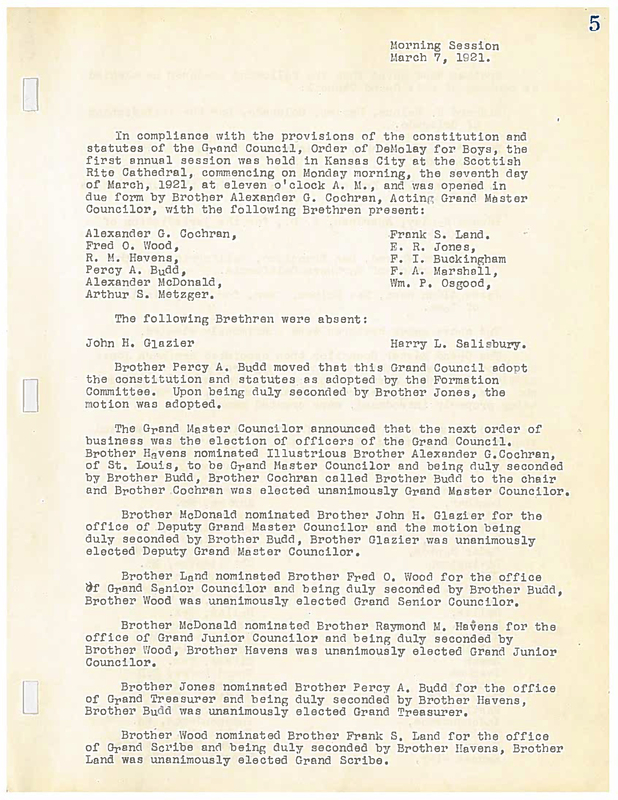 “The Scribe of each chapter shall remit to the Grand Scribe the sum of 50 cents for each candidate receiving the initiatory degree, 25 cents for each candidate receiving the DeMolay degree and, in addition, the sum of 50 cents for a Patent for each candidate receiving both degrees.” It was also provided that the annual membership fee for each member would be 15 cents. 1.) Why did they adopt the Constitution document first before any other business? 2.) With 52 Chapters in place, and with officers and advisors working the program, the need to issue charters to them was high on the list of tasks for the new Grand Council. Why, do you think, were Charters so highly valued in the early years of DeMolay? 3.) Choosing the 5 original Obligatory Days was one of the earliest votes of the Grand Council. Why did they feel this was so important? Which of our present Obligatory Days are missing, and why?